starts later this week. 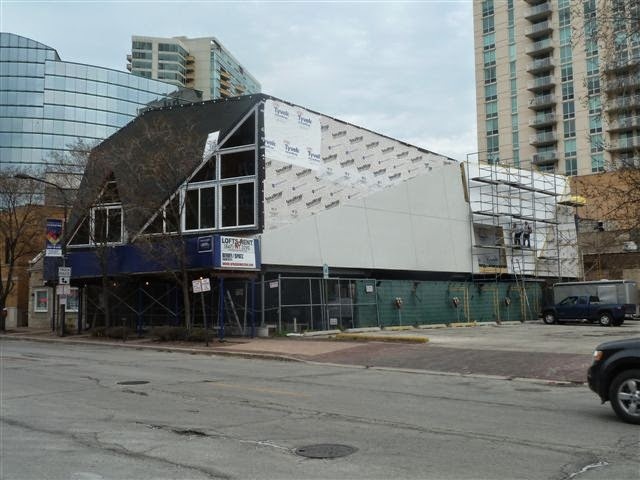 The END is on the horizon including one unit remaining to lease. ORNAMENTAL IRON: stair stringers and treads are ready for assembly. 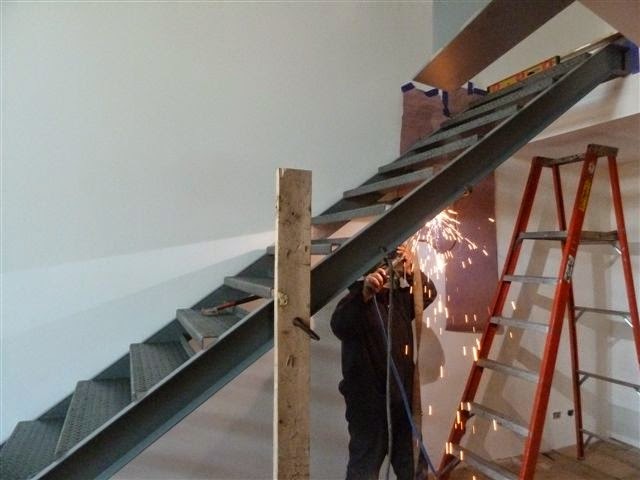 ORNAMENTAL IRON: stringers are in place, treads are being tack welded by jose. 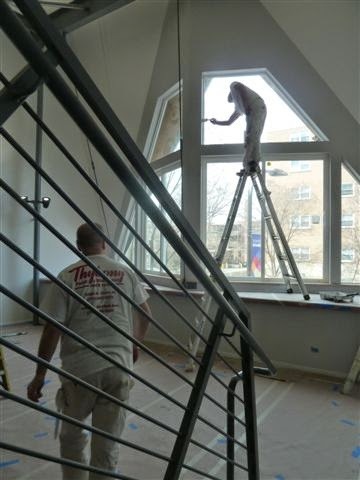 ORNAMENTAL IRON: rails have been shop fabricated and are being installed. ORNAMENTAL IRON: rail in unit 1 is being welded to the structural steel column which keeps the rail rigid. 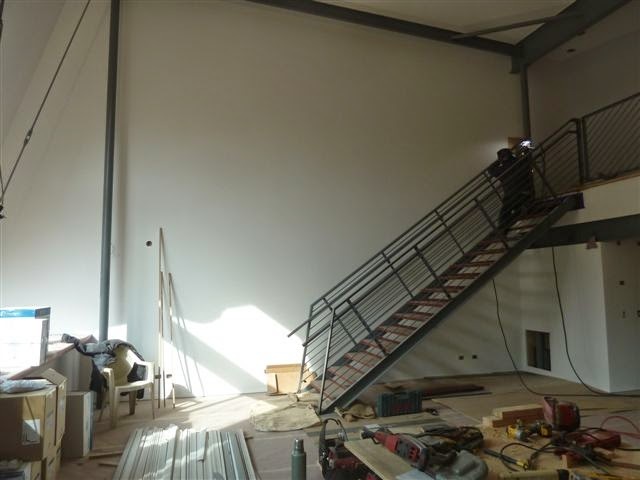 ORNAMENTAL IRON: stair system in unit 1 is ready for sanding and painting. 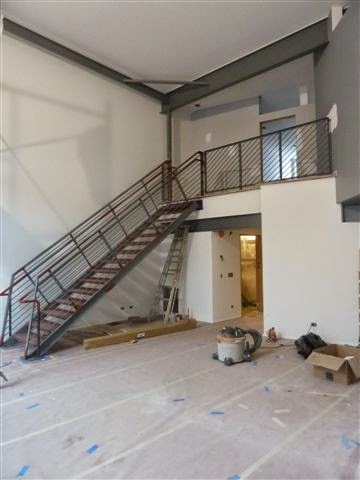 ORNAMENTAL IRON: view from the 2nd level in unit 1. 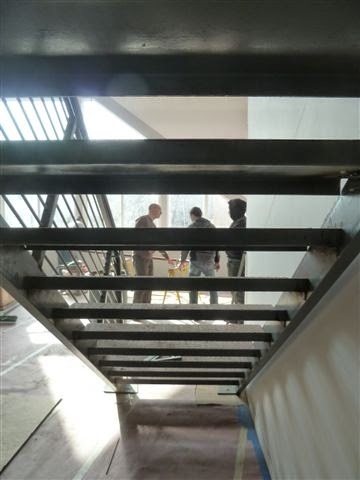 ORNAMENTAL IRON: stair system in unit 2 is in progress. 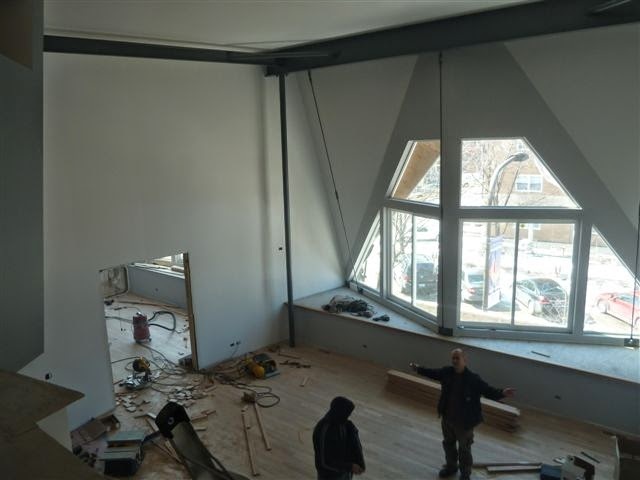 matt, kris and jose discuss the wall handrail installation. 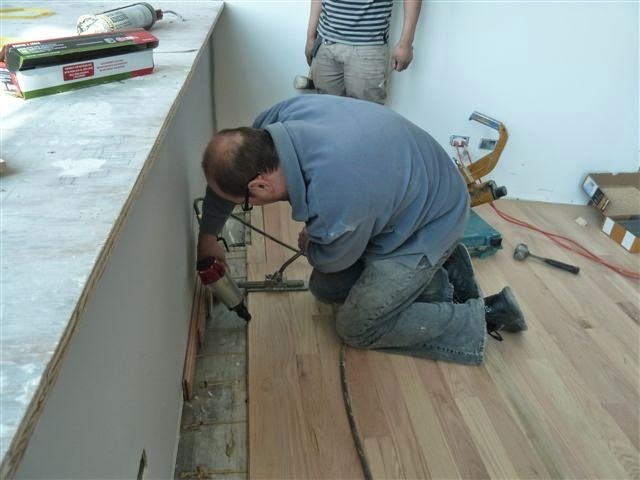 HARDWOOD FLOOR: 3" oak strips are being installed in unit 4. 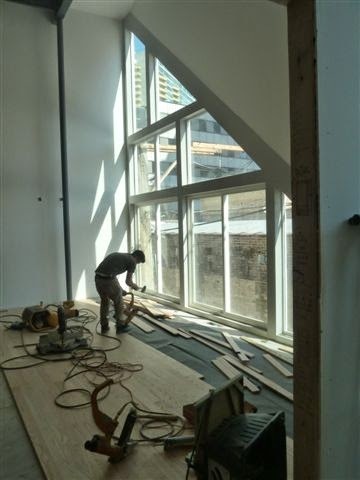 HARDWOOD FLOOR: flooring has been installed on level 1 in the oak street units. 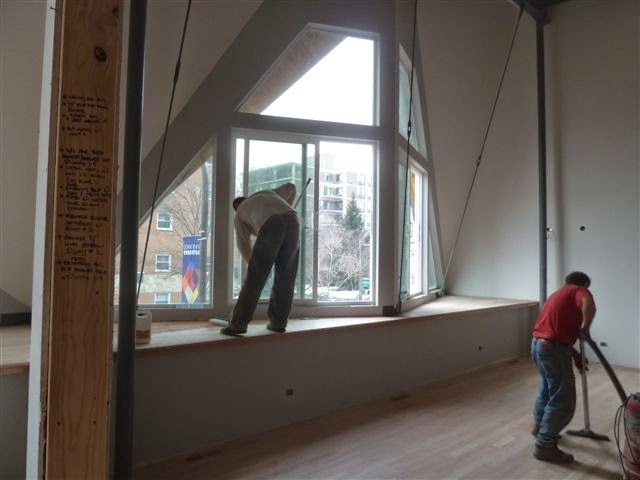 HARDWOOD FLOOR: sorin is working toward the bay window. 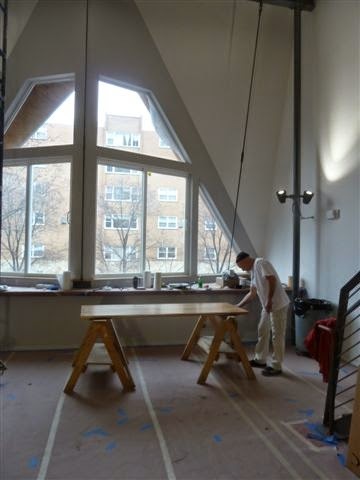 HARDWOOD FLOOR: matt checks unit 1 floor installation...looks good. 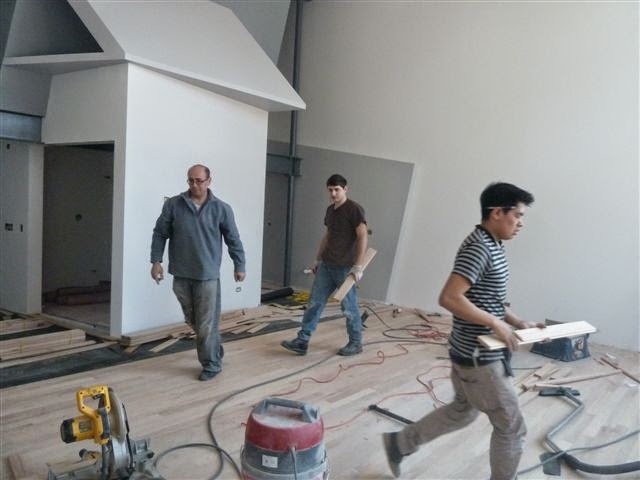 HARDWOOD FLOOR: sanding is complete. 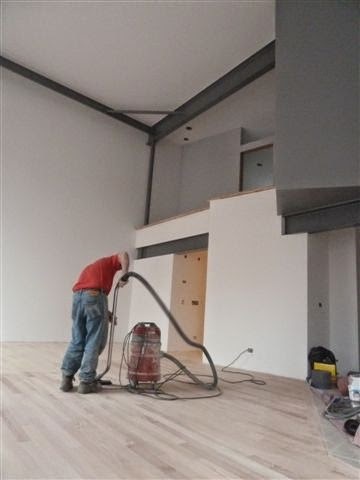 floor is thoroughly vacuumed prior to waterbased finishing system. 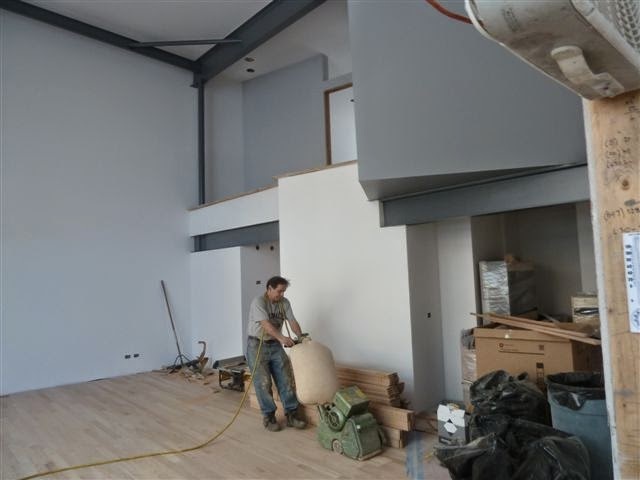 HARDWOOD FLOOR: sorin is apply the sealer which is the first step in the finishing process. 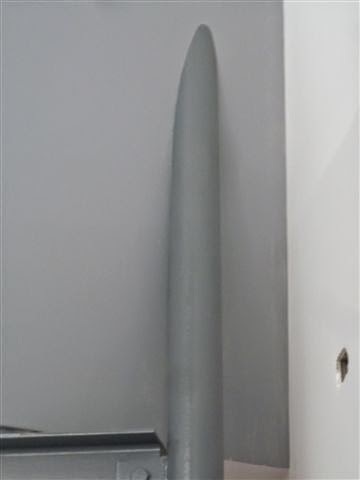 this is followed by 3 coats of "street shoe" which is a commerical grade finish designed for shopping centers. we have been using this product for 5 years and I have it in my own home...GOOD STUFF. 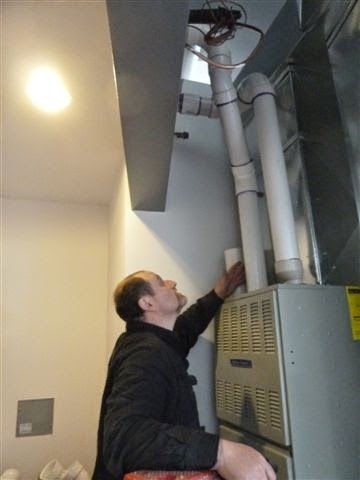 HVAC: oleg is installing a 90% efficient furnace. 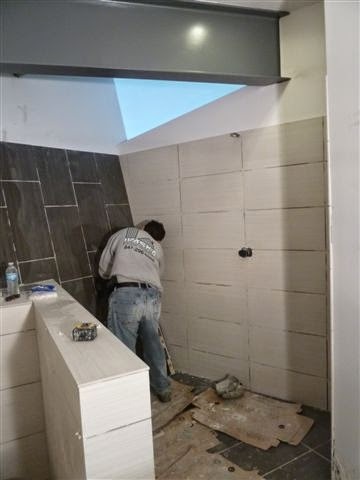 CERAMIC TILE: arben is grouting the shower in unit 1. 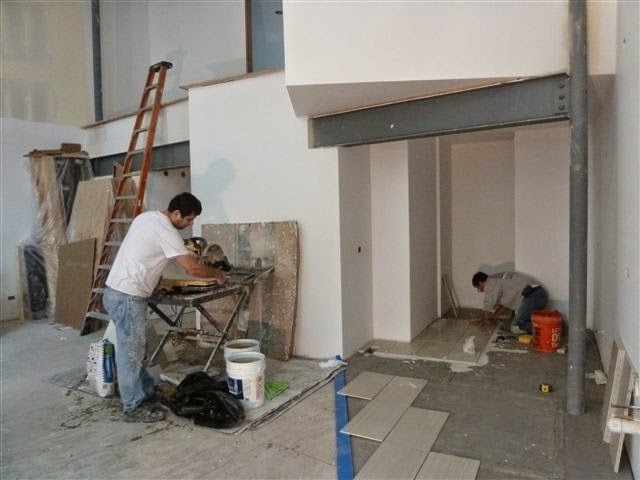 CERAMIC TILE: frank and arben are installing the floor tile in unt 4. 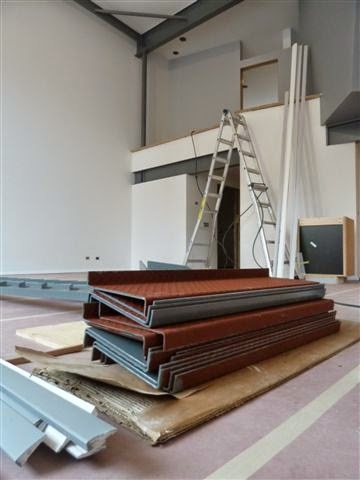 CERAMIC TILE: backspash tile is being installed in unit 3. CERAMIC TILE: backspash tile is ready for grout. 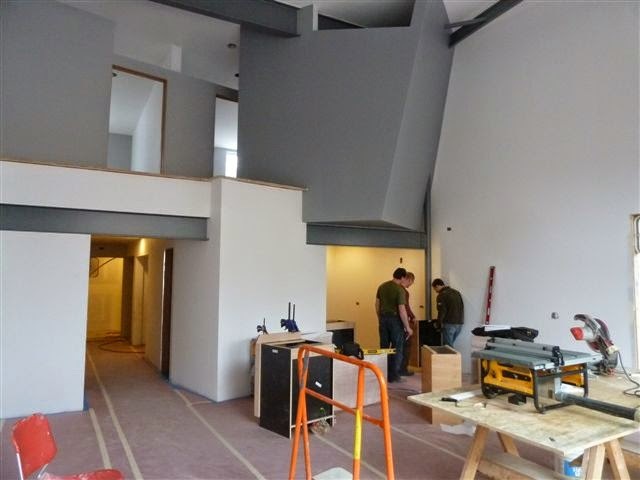 PAINTING: 2nd finish coat is being applied in unit 1. 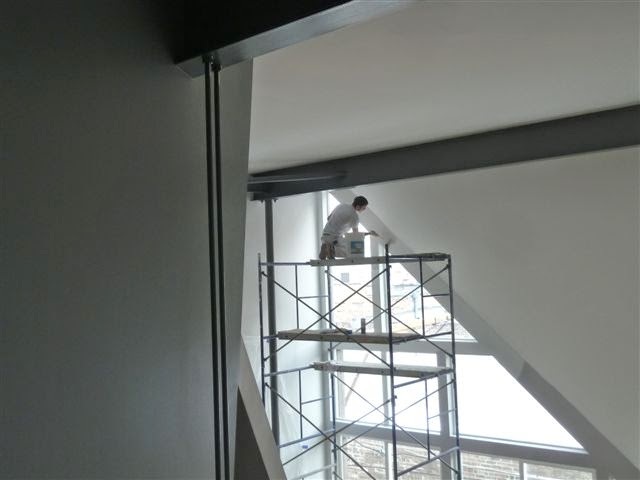 PAINTING: lucasz is preparing the steel stair for paint. PAINTING: final finish coat of low VOC polyurethane is being applied to a bi-pass closet door. 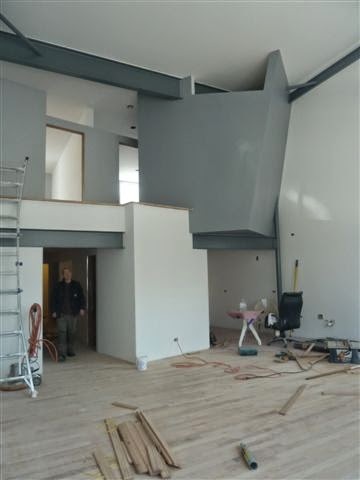 it's easier to this flat prior to installation. 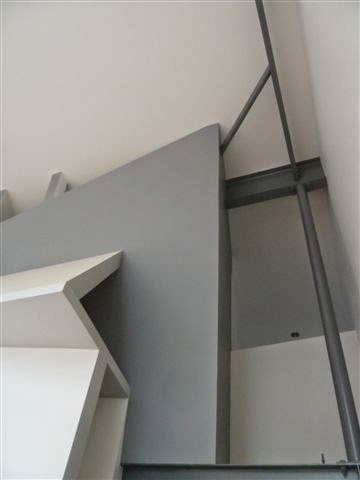 PAINTING: a little bit of patching is still left at column/2nd floor bath wall intersection to get things right. 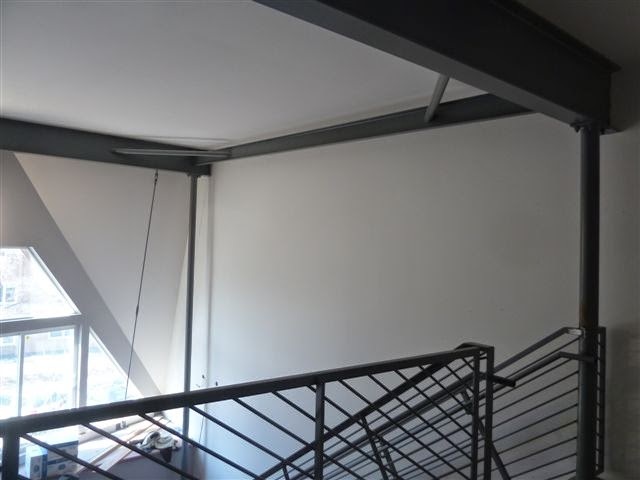 PAINTING: looking up from unit 3 kitchen. ready for final coat. PAINTING: final coat is being applied to unit 4 window wall. THE TEAM: lunch and smartphones. 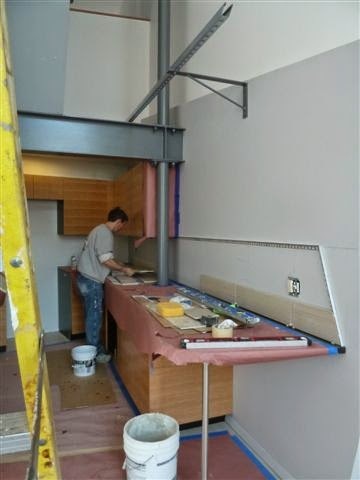 CARPENTRY: matt, tomek and kris are laying out the kitchen cabinets in unit 1 prior to starting install. 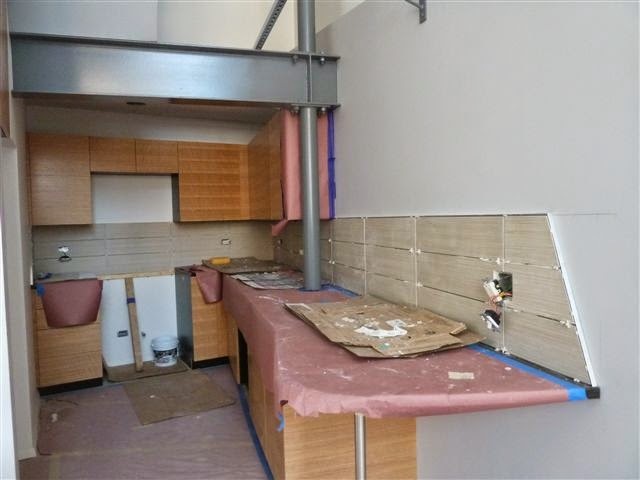 CARPENTRY: kitchen is ready for countertops. 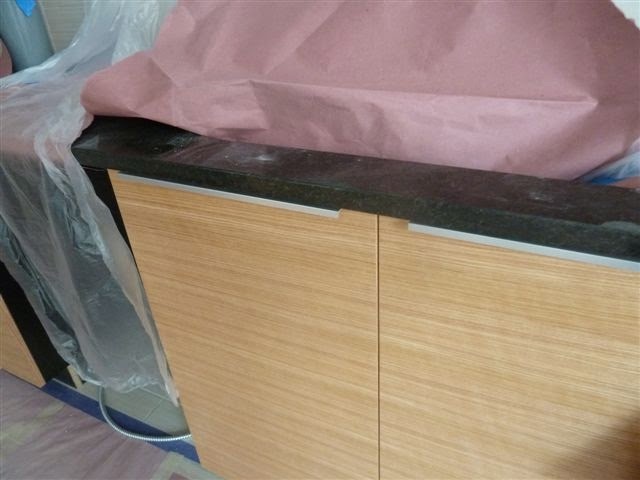 CARPENTRY: granite tops and cabinet pulls have been installed. CARPENTRY: cabinet pull at sink base. 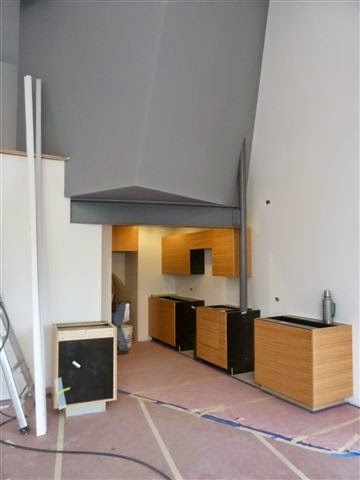 the cabinets are fabricated out of all 3/4" material. the doors and drawer fronts are rift cut oak (straight grain) with a natural finish to match the hardwood floors and interior doors. 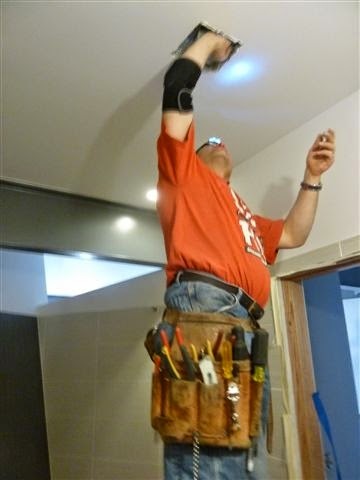 ELECTRICAL: exhaust fan is being installed in 2nd floor bath. 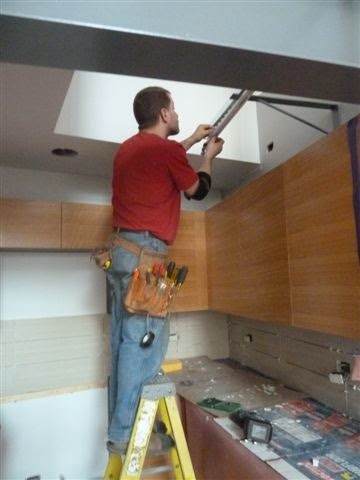 ELECTRICAL: konstantine is installing the kitchen light track onto a piece of aluminum unistrut so downlight hits the center of the countertop below. 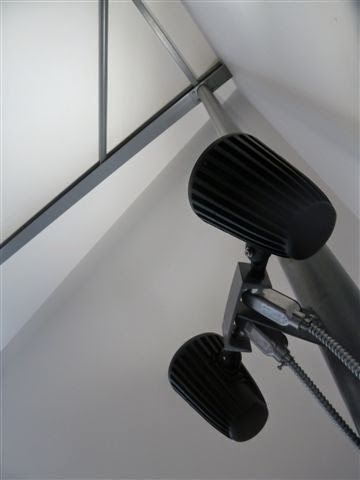 ELECTRICAL: custom indirect lighting for all the TALL spaces. 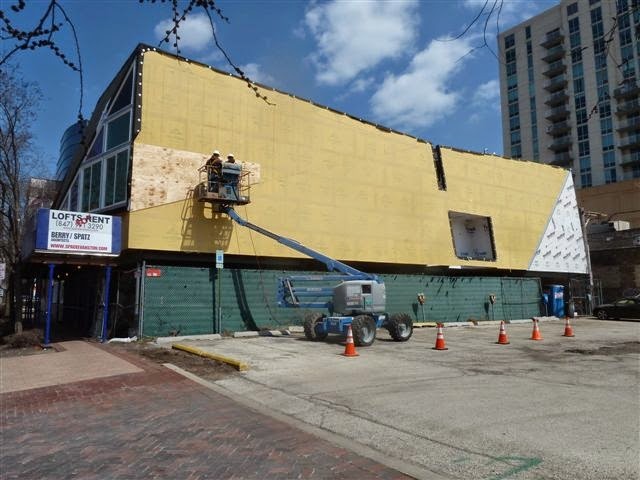 CARPENTRY: prep begins for the exterior finishes.5/8" cdx plywood + housewrap has been installed. 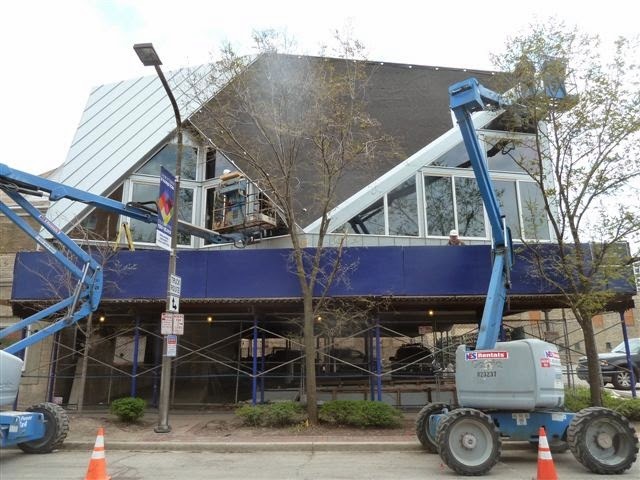 aluminum trim is being fastened. 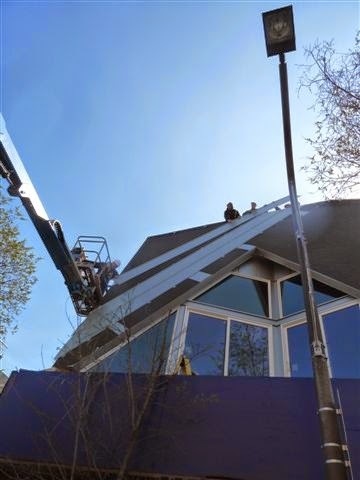 this trim provides a clean intersection between the stucco that will be applied to the yellow densglass gypsum sheathing and the 18" standing seam aluminum panels that will be screwed to the adjacent plywood. 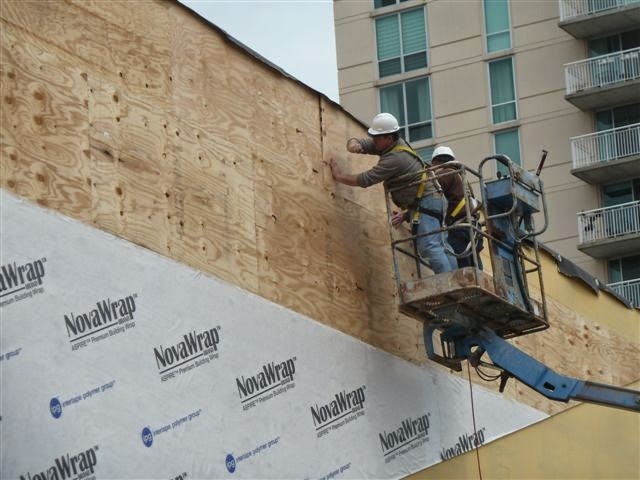 CARPENTRY: another section 5/8" plywood is fastened to the S. elevation. 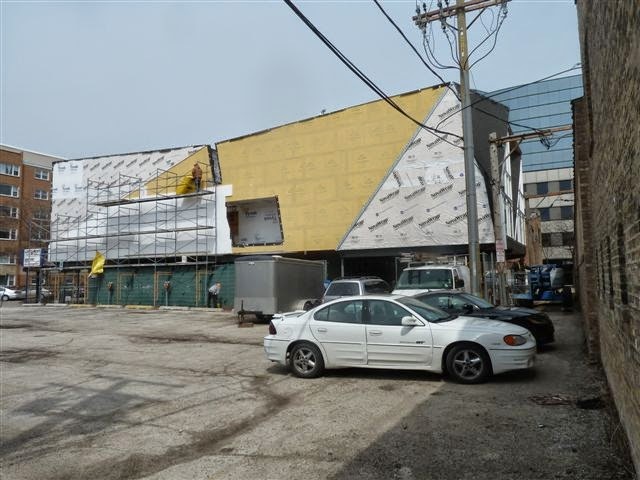 2 sections of this firewall (no windows permitted per code) will be skinned in 18" standing seam aluminum panels. 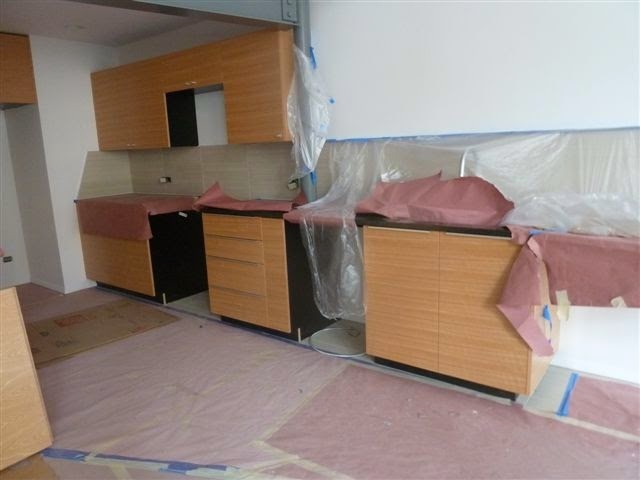 CARPENTRY: 5/8" plywood is being covered with housewrap. CARPENTRY: tomek & kris are nailing the last pieces of plywood. 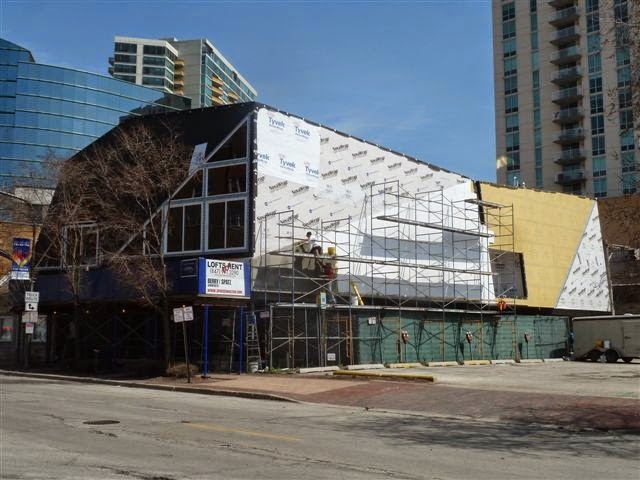 EXTERIOR METAL SKIN: window openings are "picture framed" with custom designed metal trim prior to stucco (EIFS) install. 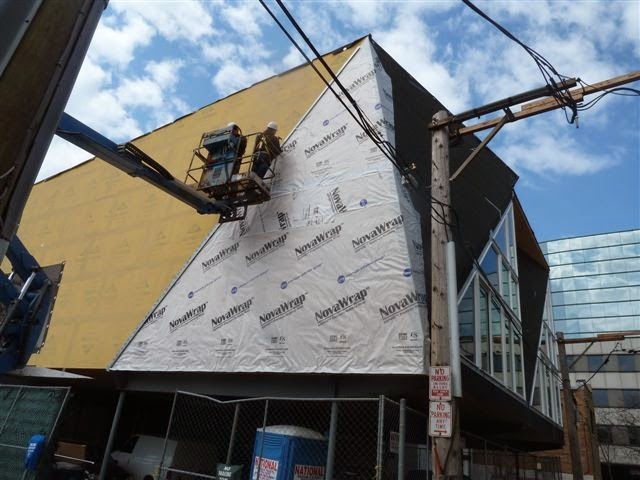 EIFS: 1.5" foam panels are adhered to the densglas gypsum sheathing. 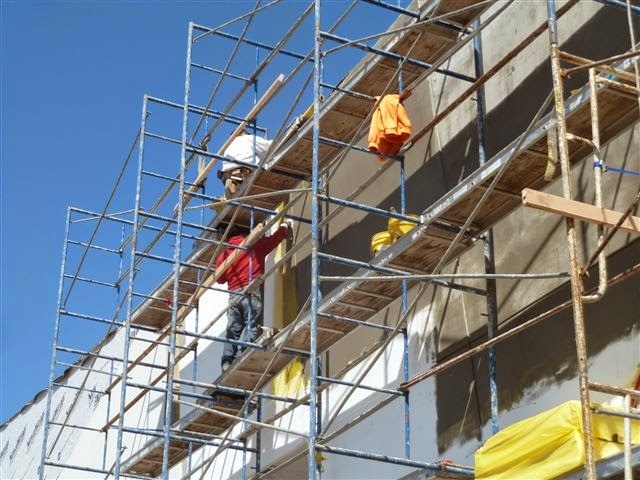 EFIS: a skim coat of the manufacturer's (STO) holds the reinforcing mesh in place. EFIS: next the finish coat is applied. 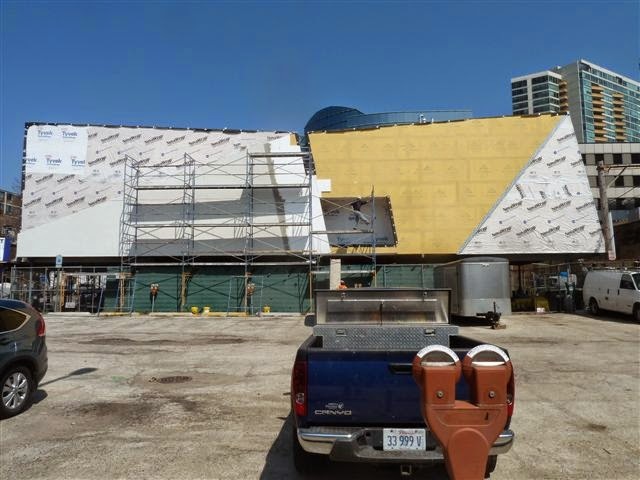 when finished, the scaffolding will be re-assembled to complete the section to the right. EFIS: panel joints have been layed out with matt. a "v" groove is then cut with a "hot wire tool". 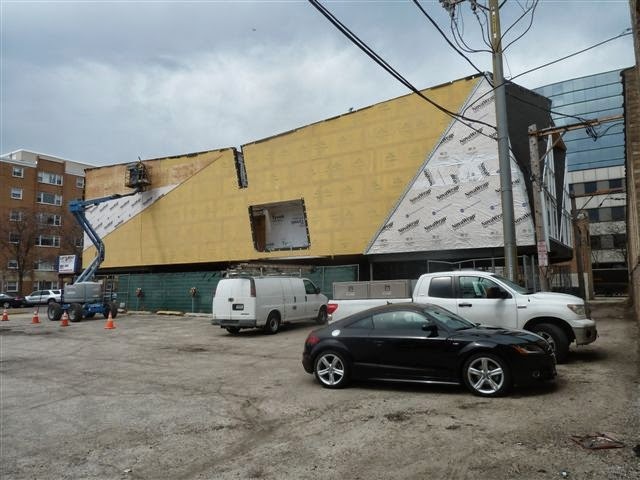 joints are not required by the manufacturer, but paneliztion permits easier repairs. EFIS: one section is complete with one to go. 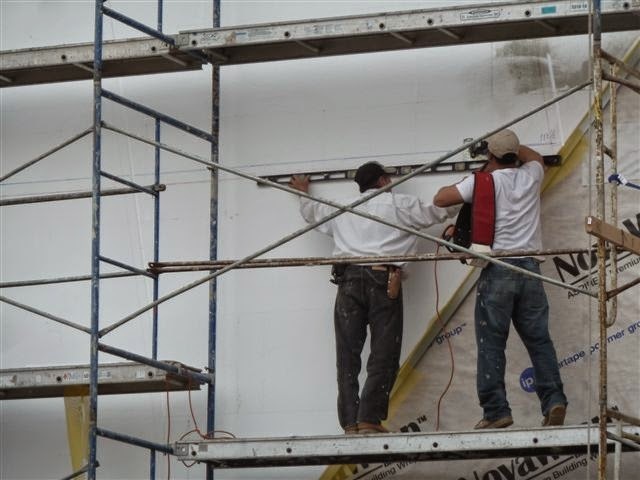 EFIS: skim coat with fiberglass mesh is being installed on the 2nd section. 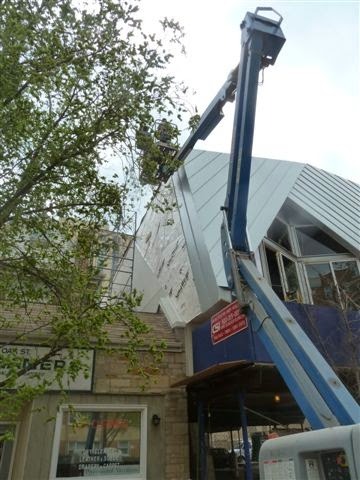 EXTERIOR METAL SKIN: with trim complete, aluminum standing seam panels are now in process. 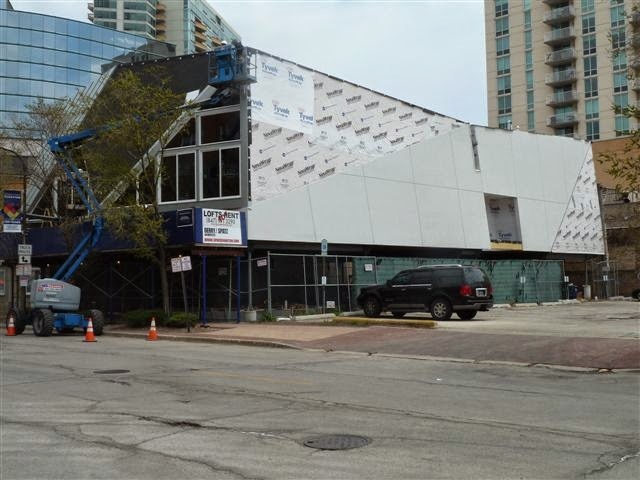 EXTERIOR METAL SKIN: stucco is done.aluminum panel installation continues. EXTERIOR METAL SKIN: "dueling" articulating arm lifts. 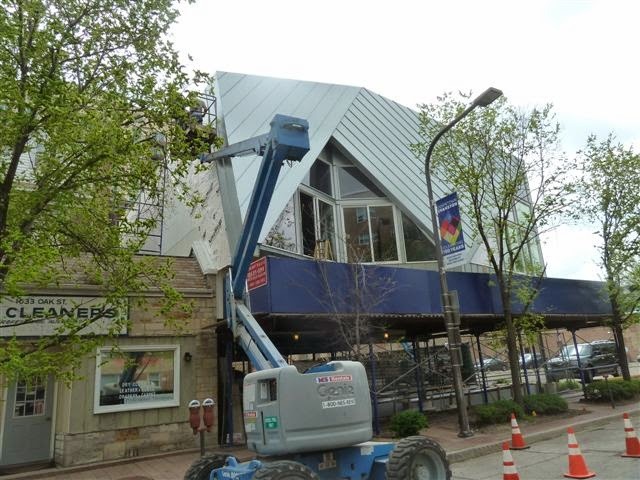 EXTERIOR METAL SKIN: oak street (W. side) skin in getting there. 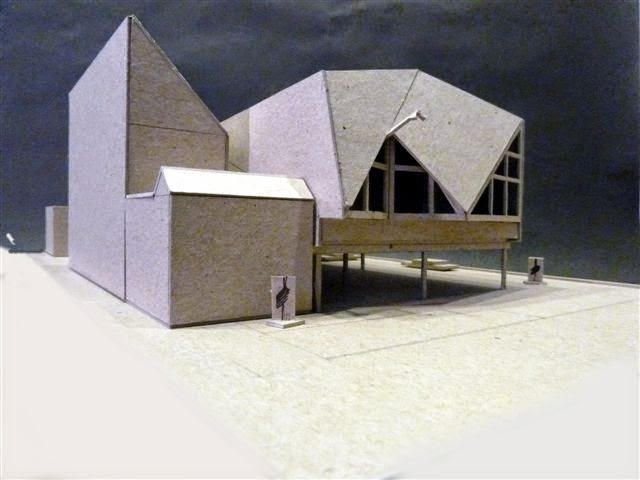 EXTERIOR METAL SKIN: on to the north section (looking SE).